Professor Kompressor visits Walter's family, offering a remedy for the dog's digestive disorder: special food that must be mixed in his Kompressatron. Unfortunately, the professor's cure doesn't work, so Father has to take matters into his own hands. Father's combination of ingredients has a strange effect on the pooch. Walter blows up like a balloon and floats out the window! Just when it looks as though Walter's paws may never touch Earth again, he encounters a flock of butterflies in distress. Only he has the hot air that can save them from an icy death. once he lets it rip, Walter's flying days are over. (Or are they?) 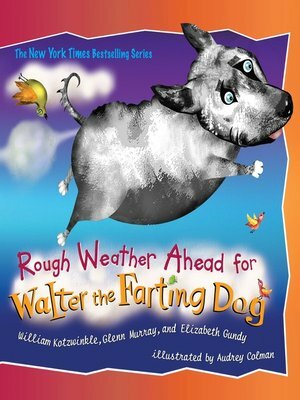 Plenty of laughs and cheers will arise from this story that takes walter to new heights. William Kotzwinkle and Elizabeth Gundy live in Maine. Glenn Murray lives in Fredericton, New Brunswick, Canada. Audrey Colman lives in Berkeley, California.